An integral membrane protein (IMP) contains one or more hydrophobic domains that preferentially anchor the protein into one or both sides of the phospholipid bilayer. Varied in structure and composition, IMPs are responsible for a multitude of indispensable cell processes including, adhesion, signal transduction, and carrier mediated transport. Information regarding the structural and biophysical properties of IMPs are crucial to fields of pathology and drug development. Yet, our understanding of the functional and conformational properties of many IMPs remain obscure due to pervasive difficulties in the staging and crystallization of this unique class of biomolecules. The folding of an IMP depends strongly upon on the complex interplay of ionic bonding, hydrogen bonding, hydrophobic, and van der Waals interactions facilitated with its host environment, making it difficult to ascertain functional conformations in non-native settings. Ongoing projects are dedicated to achieving two main goals: (i) Simulation of the optimum conditions of native membranes with polymer-supported reconstituted lipid bilayers, and (ii) delivery of IMPs into supported lipid bilayers using nanolipoprotein particles (NLPs). Using highly modular and well-defined biomimetic systems, we aim to overcome many of the obstacles associated with conventional sample preparation techniques required for high-resolution structural characterization of IMPs. Given their significant roles in cellular development, proliferation, angiogenesis, and cancer, our group focuses on two protein families: G protein-coupled receptors (GCPRs) and ErbB receptor tyrosine kinases. This work is in collaboration with the Coleman Research Group in the University of California, Davis Department of Radiation Oncology. 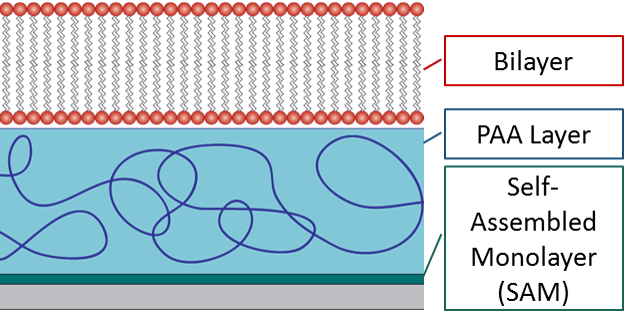 Schematic cartoon of a simple polymer-supported (reconstituted) lipid bilayer. The polymer spacer acts to prevent undesirable interactions between proteins embedded in the bilayer and the underlying solid substrate. are typically tens of nanometers in diameter. Apolipoprotein, a protein which is responsible for forming high-density lipoprotein (HDL) particles in the human body, acts as a “belt” or “scaffold” that stabilizes the structure in solution.